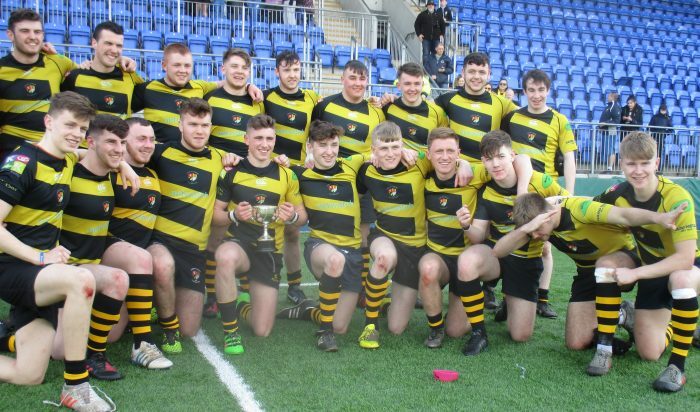 Under 18 Leinster Premier League Final Carlow 50 Skerries 17. Leinster Premier Final at Donnybrook on Sunday. conquerors Skerries were simply blown off the park for much of the game. Connacht side when they won the Pro 12 trophy. two of the tries to put his side 19 nil up after the whirlwind 1 st 12 minutes. With five tries and three conversions Carlow led 31 – nil at the interval. the Carlow line. The Oakpark lads continued to keep the North Dublin opposition out. Ruarie Dunbar saved a try in the corner by tackling his opposite winger into touch. big loss to the defence for during his 7 minute absence Skerries got in for two mauled tries to make the score 31 – 12.
through the middle after his centres had made ground. the scrum and the Carlow lineout was assured. McDermott capt, Daniel Crotty, John Murphy, Liam Slator, Caolan Fitzhenry, Sean O Brien, Shea Somers, Dominic Rice, Aidan Raply, Conor Moore.